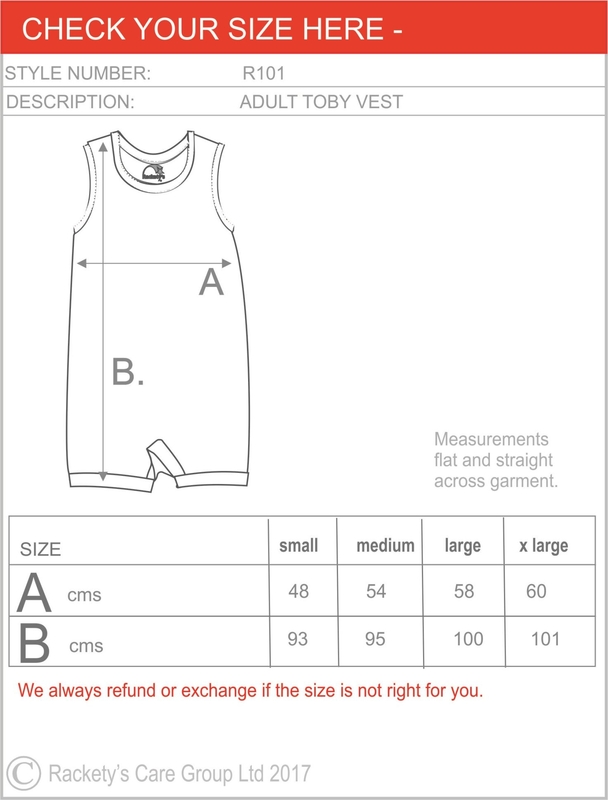 Made from stretchy soft cotton with elastane, Toby vests will help keep everything in the right place, stop the embarrassment of nappies being on display, and keep you or the person you care for warm and comfortable all day and through the night. The shorty legs are to prevent determined nappy dippers from sneaking their hands into their nappies or pads. They are a close fitted garment with double strength fabric at the crutch and FIVE poppers at the back of the crutch to make it difficult for the user to get in but still allow the carer to change nappies or pads as required. Pure soft cotton elastane stretchy knit fabric. Five poppers fastening at the back to allow for nappy changing. Back opening makes it harder for the user to open the poppers. Short legs and close fit to keep nappies in place and reduce access to nappies. Strong double layer of fabric between the legs. Poppers placed at the back stop the wearer from tugging them open.